Two books provide tips for protecting your job and dealing with the irregular rhythms of life. Even if you're the most competent person in the company — or the world — sundry circumstances affect your tenure. Dealing with these uncertainties is now part of every employee's responsibilities, though the basics of ''doing your job'' and being mindful of your actions and how you are perceived by your boss and your co-workers still apply. 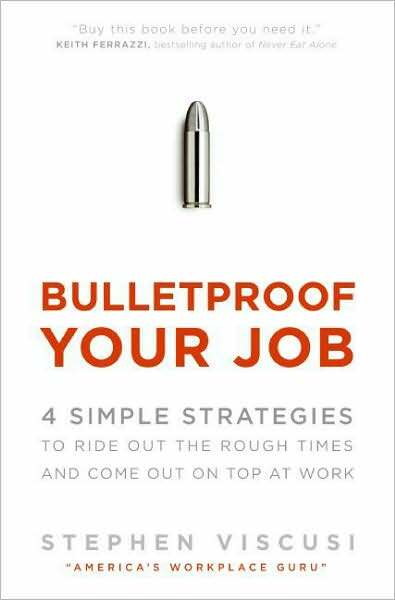 Bulletproof Your Job: 4 Simple Strategies to Ride Out the Rough Times and Come Out On Top at Work. Stephen Viscusi. Collins. 192 pages. Viscusi is a recruiter and a frequent expert-guest on TV and radio talking-heads shows. He's pretty good in this role; outspoken, direct and somewhat abrasive. But a book is a different medium, and here Viscusi comes off as a bit overbearing. His tone throughout this tome is strident, with little room for ambiguity or disagreement. Maybe some people need that, though a one-size-fits-all solution usually fits no one at all. Still, if you can get beyond the bluster, Viscusi's admonitions are mostly commonsensical, so you can apply them as you see fit even if he states his opinions as incontrovertible facts. 1. Set a Goggle alert with your boss' name. 2. Set a Technorati alert for your company and stay in touch with the blog chatter about your company. 3. Always have a (firm handshake) to seal a deal. 4. Company gossip is gold and can help you bulletproof your job. 5. Bosses are trained to say office politics don't exist in this organization. Only dumb employees believe that. 6. Mentees-mentors and networking: Create a sleeper cell of friends in your company and industry who will emerge in a time of crisis. 7. Career coaches are for sissies. If you need a career coach, you don't have a career! Most of his other declarations are decent, too, but a few of the things he advocates are pure BS, like arriving at work earlier and staying later than your boss every day. That's great, but some of us have lives and routinely working late proves nothing and guarantees even less. But the thrust of Viscusi's rap is pretty solid, and you're always free to accept what you like and reject what doesn't make sense to you if you choose to read this book. 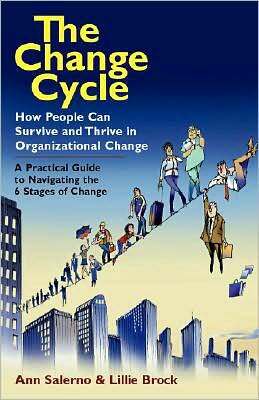 The Change Cycle: How People Can Survive and Thrive in Organizational Change. Ann Salerno and Lillie Brock. Berrett-Koehler. 199 pages. Salerno and Brock have given the issue of change a lot of thought, especially change in an organizational setting, like layoffs or acquisitions. Similar to the stages of grief, they outline the different feelings and mental states most of us experience as the reality of these extreme circumstances sinks in. This book might be too touchy-feely for some, and will probably not be embraced by everyone, but their approach integrates an awareness of human nature with psychological principles in a way that's fairly easy to understand. The two authors keep things fairly light, too. It would be easy to embrace the dark side of all this, but instead of being somber, they invoke humor and worldliness in an authentic and heartfelt manner. Their systematic approach may not be for everyone, but given the chaos many of us encounter, this book could be a very useful resource for understanding and coping with the irregular rhythms of contemporary work and life.